Whether you were born with thin lips, have lips that don't match, or you've formed wrinkles around your mouth that have thinned them out over time, dermal fillers like Restylane®, is an exciting face filler that can help restore fullness or add the dramatic effect you've looked for. Fillers are extremely effective when used in conjunction with Botox, but the two products work very differently in how they reduce the detrimental effects of time. Botox is injected to reduce the effects of the muscles that cause wrinkles. Fillers, on the other hand, work to replace the fullness of the skin. One product prevents the continuance of the damaging actions, while the other repairs the harm that has already been done. The filler products used at BEAUTE MEDI SPA are safe and natural cosmetic dermal fillers that restore volume and fullness to the skin, resulting in the correction, reductions, and often elimination of facial wrinkles and folds. Those same industry standard products are also used in lip enhancement. Fillers are made of non-animal-based hyaluronic acid; a natural substance that already exists in the human body. The hyaluronic acid comes in the form of a crystal-clear gel called Non-Animal Stabilized Hyaluronic Acid. They are injected directly into the skin in tiny amounts through an ultra-fine needle. At BEAUTE MEDI SPA, we pride ourselves in creating an artistic accentuation of the individual's strengths, while minimizing any flaws. This may range from a subtle filling of the lips to a more dramatic creation of natural cheek lines. This innovative treatment is approved here in Hong Kong, U.S. and Canada for the treatment of facial wrinkles and folds. Fillers often last for 9-12 months, but it is variable depending on the amount injected and the area. For example, lips fillers wear off sooner, since we are using them so much! 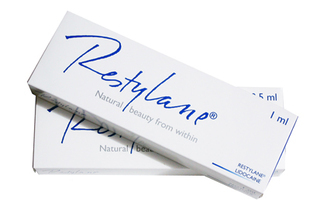 For more information on RESTYLANE and BOTOX fillers, just pick up the telephone and call our office. We have brochures, patient education literature, articles and many other resources we are glad to share with you.